Harrogate Town manager Simon Weaver said he “couldn’t be more proud” of his players after watching them shine on the big stage. 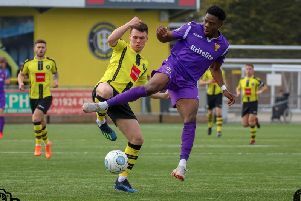 A six-figure audience tuned in to BT Sport’s coverage of Saturday’s 3-1 success over Hartlepool United, the first-ever live television broadcast of a fixture at the CNG Stadium. And those who took in the action were treated to a slick footballing display that Weaver felt aptly showcased everything that is good about his team. “I said before the game that I wanted us to show what Harrogate Town are all about and I think the lads did great,” the Town boss reflected. “They turned it on in front of the TV cameras and a really big crowd. Sometimes players can go into their shells in these situations, but we didn’t. “Everyone was right on it. The passing from minute one was good and we were comfortable in possession throughout. “We moved the ball quickly, and when we got it to the front players we looked a real threat. “They deserve a lot of credit for performing under that kind of pressure. Having recorded back-to-back victories following a run of five games without one, Weaver feels his team now have a platform from which to go on and put a sequence of results together as they look to consolidate their position in the National League play-off places. “There was a fantastic feeling in the dressing room after the game and also a real buzz about the whole place,” he added. “We don’t get too carried away whether we win or lose, but you have to take it all in at moments like this. They don’t come around too often. “I’d like to think that we can build on this feeling and this result and put a bit of a run together. “We need to focus on maintaining our consistency. Town will however have to wait for the chance to make it three wins out of three as they are without a fixture this weekend due to Barnet’s progress to the fourth round of the FA Cup.